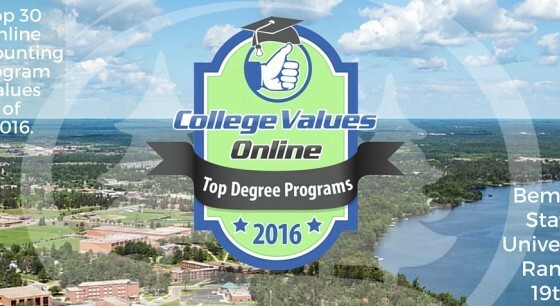 In a recent survey by College Values Online, Bemidji State University’s online Accounting program ranked among the best in the country. Our strong commitment to faculty advising is one reason for that. Gain the technical and theoretical knowledge needed to be an accountant by completing the final two years of your four-year degree online. Prepare yourself for an ambitious career with a well-rounded business education without giving up the job you already have. If you have an AA, BS, or BA, you may be able to complete the Accounting BS in as few as 2 years. You also have the option to focus on advanced accounting courses in the online program to prepare for the Certified Public Accounting Exam. You must transfer at least 24 semester credits to begin this online degree-completion program. Consider completing the Minnesota transfer curriculum first, to simplify your major and degree requirements from BSU. 71 credits – view catalog for required courses. The Accounting major is available completely online and also on-campus.